From World War II to the Vietnam War, U.S. Navy shipbuilders used asbestos-containing materials extensively. Every branch of the military demanded the use of the famously fireproof mineral, and the Navy was the largest consumer of asbestos by far — until asbestosis and mesothelioma began to afflict veterans and former shipyard workers by the thousands. Though shipbuilders began to phase out the use of asbestos in the 1970s, the military’s gargantuan asbestos-abatement task lasted well into the 1990s. To give Asbestos.com a firsthand perspective of the issue, former Lt. Cmdr. Kevin King recently recounted his experiences with asbestos on the USS Nimitz, one of the largest warships in the world. 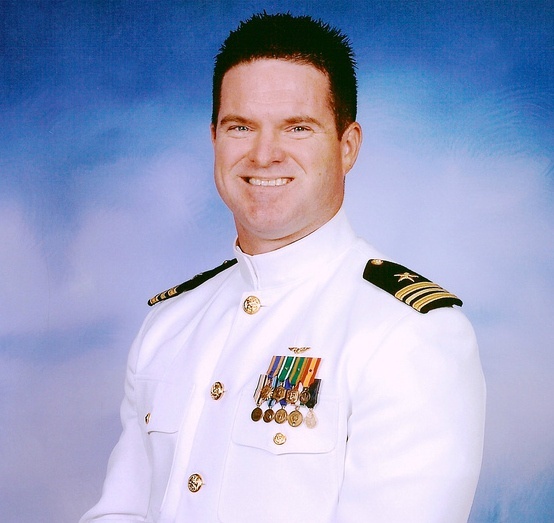 King began his career flying combat missions from the aircraft carrier during the First Gulf War, and he went on to serve in the U.S. Navy for 20 years. King was commissioned as an officer in 1988 but started interacting with Navy ships and aircraft in 1985 as a midshipman in the Naval Reserve Officer Training Corps (NROTC). Though he distinctly remembered his childhood elementary school shutting down for several months for asbestos removal, initially he didn’t think much about asbestos aboard ships or in aircraft. King became aware of the military’s asbestos issue during his first cruise in 1991, when he observed the work of inspection teams touring the USS Nimitz to identify hazardous materials. “I remember walking down the passageways after their visits and seeing ‘ASB’ written and circled in grease pencil all over the ship!” he said. As a Navy pilot, King knew dozens of acronyms, but “ASB” was unfamiliar to him. Many manufacturers, however, had been using the abbreviation to mark asbestos-containing materials for decades. Commissioned in 1975, the USS Nimitz is currently the Navy’s longest-serving aircraft carrier. Asbestos materials were used to insulate the ship’s steam pipes and HVAC ducting as well as provide protection to critical components such as pumps, valves and electrical gear. Seeing the Navy go to such great lengths to find and mark these materials made the young aviator curious, but finding information about “ASB” was hard in the days before the internet, and the military used this to their advantage. Navy officials were not about to widely publish the issues staring service members in the face via coded grease pencil warnings, and King said most of his fellow service members on the USS Nimitz probably didn’t think twice about it. “The Navy wouldn’t put us in such an unsafe environment, would they?” he asked. It turned out to be a naïve assumption to make. With the benefit of hindsight, however, King made sure to highlight the complexity of the issue. King’s first direct involvement with asbestos came after the war, when he served as the first lieutenant for his squadron in 1992–93. He described the position as the “janitor of the command,” in charge of keeping spaces clean and in good working order. At the time, the squadron’s commanding officer wanted a new tile floor put into the ready room, where the squadron was briefed and debriefed for flight operations. When they investigated what it would take to do this, the squadron discovered three layers of old tile would have to be pulled first. That required a special work order, and when the ship’s personnel removed a patch of tile for examination, it tested positive for asbestos. Multiple layers of asbestos-containing tile had to be abated from the squadron’s ready room. It had been acceptable in the Navy to tile over asbestos, because in the minds of earlier commanders, that “fixed the problem in place.” But to get the old tile up now required a great deal of work and precaution. The military had begun to give asbestos abatement the attention it deserved. Because members of the squadron were not trained or equipped to safely remove asbestos-containing materials, they called in private contractors while the ship was in port at the former Naval Base Bremerton. The contractors isolated the entire ready room from the adjoining spaces, put a negative-pressure system with proper filtration in place, and wore full exposure suits with respirators while working in the hazardous area. “After that, the dangers of asbestos became crystal clear to me,” King recalled. To explain the scale of the asbestos-exposure risks that once haunted the USS Nimitz, King described how the interior of a Navy warship is designed for function over form. Wiring, HVAC ducts and pipes for water and steam are left exposed to help with maintenance and damage control. All these components have insulation on them to prevent condensation, heat loss and injury to personnel — and originally, much of this insulation had contained asbestos. The USS Nimitz had been designed and built during the 1960s and 1970s, when the use of asbestos-based insulation was just as ubiquitous in the civilian sector as it was in the military. Unbeknownst to rank-and-file shipyard workers, sailors and construction workers alike, most types of asbestos insulation release toxic dust when damaged or cut, particularly as the materials become brittle with age. In addition, crewmen routinely used asbestos cement to repair boiler rooms in ships, which released toxic clouds of dust into enclosed ventilation systems whenever a new batch of cement was mixed. In King’s summation, the ship designers of the era had thought the benefit of using fire-resistant asbestos products to maintain the safety of the ship, especially in combat, outweighed whatever health risk there was from asbestos exposure. Tragically, the long latency period of asbestos-related diseases allowed builders and military officials to cling to this illusion for decades, until the mounting health consequences finally compelled the military to perform an about-face in policy. Now, around 10,000 U.S. veterans die from asbestos-related diseases each year, and the U.S. Department of Veterans Affairs continues to struggle with the volume of asbestos-exposure VA claims filed by those exposed to asbestos in all branches of the military. King wrote soberly about the asbestos-exposure risks he witnessed firsthand, but he gave the Navy credit for the precautions it has taken since abandoning the use of asbestos.